Links to general football websites and sites dedicated to football grounds and groundhopping. These are the best football sites on the internet. Want to see your site here? Get in touch with Rob. Kick22 allow amateur teams to create a professional website for their football club. Features include: player profiles, fixtures & results, match reports, photo uploads, videos, detailed statistics and much more! How well do you know your football stadiums? Players have 10 seconds to guess the stadium in this interactive quiz. 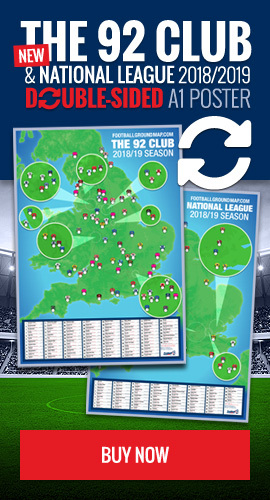 The Football Ground Guide covers all 92 Premier and Football League stadiums as well as Scotland and some non-league grounds. Includes, travel, parking, pubs, views and lots of photos. Now this is seriously cool, Chris Smith creates replicas of famous football grounds with Lego bricks. Check out Brick Stand for pictures of his creations. You can buy them as well, if you have a spare £300. #want. Chris Clements loves his Spanish football stadiums and his blog Estadios de Espana has a great amount of information and pictures - well worth a visit. Non-League Day is an annual event held each Autumn to encourage fans to support non-league/grass roots football. It's a great opportunity to get to a new ground with many clubs offering discounted or free tickets. Definitely a date to keep in the diary each year. Stuck for matchday car parking? Just Park is the answer - find cheap and reliable private parking spaces just yards from the ground. James is an artist with a passion for painting football grounds. He's got a great selection available for purchase on his website - from the Premier League right through to some of the smaller Scottish and Northern Irish clubs. Products include posters/pictures, phone cases and mugs. Check out JKM Artwork's website - the perfect gift for any dedicated football fan. Want to see your link here? Contact Rob for details.